The Commission of Inquiry released a 178-page report stating they “found numerous violations, some of which were serious and persistent,” and there is “evidence of possible criminal activity” in projects in which former Premier Dr. Ewart Brown, Derrick Burgess and Vic Ball were involved. In addition, the Commission supports ongoing police investigation into Dr Brown. The Commission looked at 11 different contracts awarded by the Bermuda Government while the PLP were in power and one under the OBA. The Commission said on some of the contracts that “no evidence was found on possible criminal activity.” This included the current airport project with Aecon and the Commercial courts renovations among others. Dr. Brown was implicated in the Global Hue advertising and marketing non-tendered $14M contract. The Commission found “possible criminal activity” and supports the ongoing police investigation of Dr. Brown. There was no evidence with regard to Permanent Secretaries Cherie-lynn Whitter and Marc Telemaque. 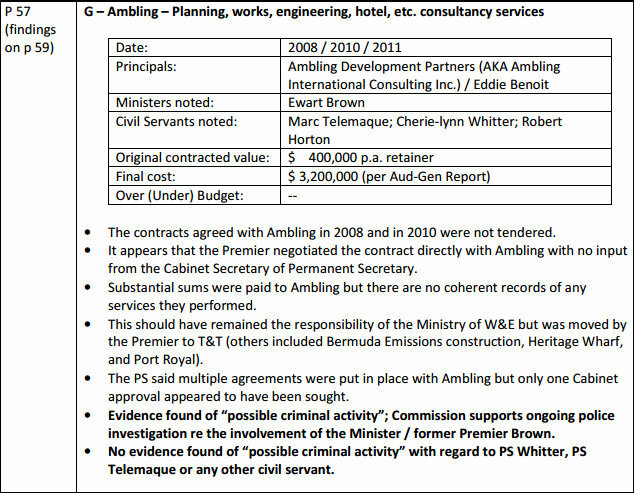 Dr. Brown was also indicated of “possible criminal activity with two non-tendered contracts with Ambling Development Partners and Eddie Benoit that paid out $3.2M. The contract originally started off as a $400,00 retainer. The Commission “supports the ongoing police investigation” of Dr. Brown. In addition, the Commission found that the contract should have remained under the Works & Engineering Ministry but was moved to Tourism and Transport. The Commission said that there was also “possible criminal activity” with the TCD contract awarded to Bermuda Emissions Control Ltd [BECL], It said that it supports the ongoing police investigation of Dr. Brown in regard to this. The original construction contract was supposed to be $5.3M and ended up being $15.3M while the ongoing operations contract was an additional $600,000 over the original contract. Minister Dennis Lister failed to disclose to the Cabinet the technical officers’ recommendations with regard to the new Magistrates Court and Hamilton Police Station but the Commission said there was no evidence of criminal activity on his part. But a second contract awarded under the tenure of Minister Derrick Burgess, the Commission said there was evidence of “possible criminal activity” and supports the ongoing criminal investigation. In addition, it also supports the ongoing police investigation with regard to Dr. Brown on this contract. The Commission stated that the principals of this contract included Mr. Burgess’ cousin and Dr. Brown’s half-brother. It said the principals were not disclosed as required and that Derrick Burgess knew of his cousin’s and Dr. Brown’s half-brother’s involvement from a conversation he had with consultant Julian Hall in October 2008. The original value of this contract was $72M but came in $17M over budget at $89M. There was no evidence of any criminal activity by any civil servant on this project. 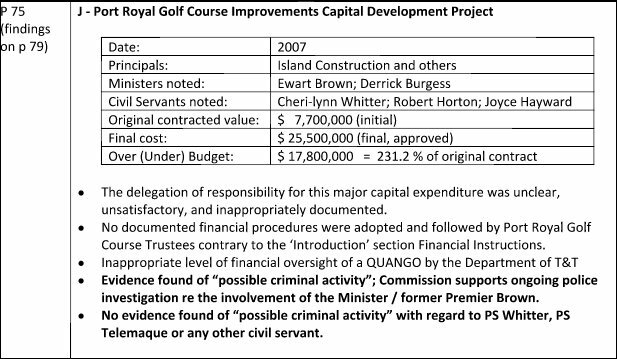 Both Dr. Brown and Derrick Burgess were also cited for “possible criminal activity” with regard to the Port Royal Golf Course project deal with island Construction. The Commission also supports ongoing police investigation on both. The original contract was $7.7M with the final cost ballooning to $25.5M, a total of $17.8M over the original amount. It stated the delegation of responsibility for this project was “unclear, unsatisfactory and inappropriately documented.” It further stated that no documented financial procedures were adopted and followed by the Port Royal trustees and there was “inappropriate oversight” of a Quango by the Department of Transport and Tourism. Evidence was also found to support “possible criminal activity” by Dr. Brown and Derrick Burgess with the Heritage Wharf project with Correia Construction and NB Entech. The Commission supports the ongoing police investigation. The project started off as a $39M contract with the final cost being $60M. Besides the delegation of the project from W&E to T&T being unclear, unsatisfactory and inappropriately documented, the Commission cited the Premier for not bringing the final terms of the contract to Cabinet but Cabinet did approve of island Construction. It also said the contract did not allow for the right to audit nor did it require a performance bond. 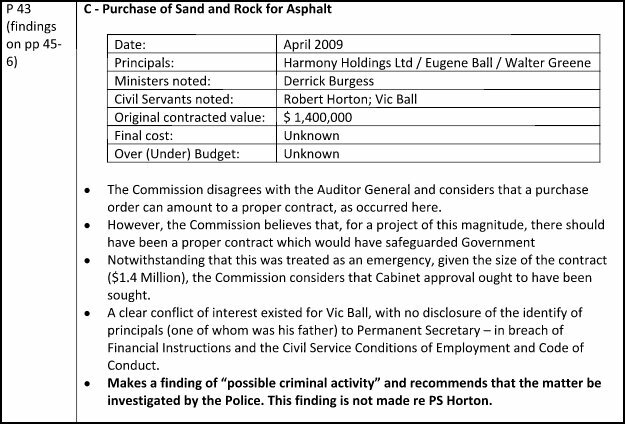 The Commission said there was possible criminal activity regarding the purchase of sand and rock for asphalt in a $1.4M contract with Harmony Holdings, Eugene Ball and Walter Greene. It said there was a clear conflict of interest for civil servant Vic Ball, who failed to disclose the identity of his father as one of the principals involved in the contract. It further stated that a proper contract should have been issued to safeguard the Government. The Commission recommends that the matter be investigated by the police with regard to Vic Ball.